Are you thinking of a fun way to make a good impression the parents of kids? You can consider handing our Silver Reflective Pumpkin bags to children who come into your store. You can also market your store on the back of the shiny reflective pumping bag. 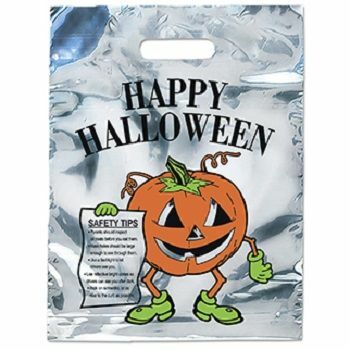 Wish children a happy Halloween using our shiny consolidated bags. Our courier bags will catch the attention of children from a distance. If you are hosting a Halloween party, you can put sweet treats inside the bag, passing it out at the end of the party. If your store sells things that interests children, you can hand out the bags to them. Our Sliver Reflective Pumpkin Shiny Bags will ensure your store or event’s name shines and sparkles when the light hits it.